Funder OPR As a funder who wants to promote open science, I need a list of journals that comply with my policies on open peer review so that I can recommend them to grantees. All All As an advocate, I want to know journal policies across fields so that I can monitor the adoption of certain policies over time. Researcher OPR As a PI, I want to quickly and anonymously check policies on co-reviewing so that I can involve my student in peer review and make sure I’m compliant and giving students credit. Publisher OPR As a journal editor or publishing staff, I want to review and evaluate my journal’s peer review policies against others so that I can best serve my research community. Researcher OPR As a meta-researcher, I want to pull journal peer review policies so that I can study the history, trends, and effectiveness of different peer review implementations over time. Funder OPR As funder, I want to know the journals that publish reviewer names and their reviews so that my grantees can get credit for peer review. Institution Co-review As the director of a graduate program, I want a list of journals open to co-reviewing so that I can facilitate peer review training. Researcher OPR As a graduate student wanting to learn to peer review, I want a list of journals that publish peer review so I can read good and bad examples. Researcher OPR As a PI, I want to know which journals will give me credit for doing peer review so that I can build a stronger tenure and promotion package. Researcher OPR As an author, I want to pick journals that publish peer review so that I can receive more constructive feedback on the research. Researcher OPR As an author, I want a list of journals that do “open interaction” collaborative peer review so that the requested revisions are more clear. Researcher OPR As an early career researcher concerned about bias, I want to choose a journal that publishes peer reviews so that this risk would be minimized through transparency. Funder OPR As a funder, I want to read the peer review of the papers I fund so that I can ensure the results are not shared in a journal that has predatory publishing practices. Journalist Preprints As a journalist, I want authors to know the policy of journals they’ve submitted to regarding media coverage of preprints so that I can write about preprints without causing a paper to be rejected. Researcher Preprints As an author, I want to quickly check the list of preprint servers approved across journals so that I do not waste time submitting to a journal where my preprint posting would go against a journal’s restrictive prior publication policy. 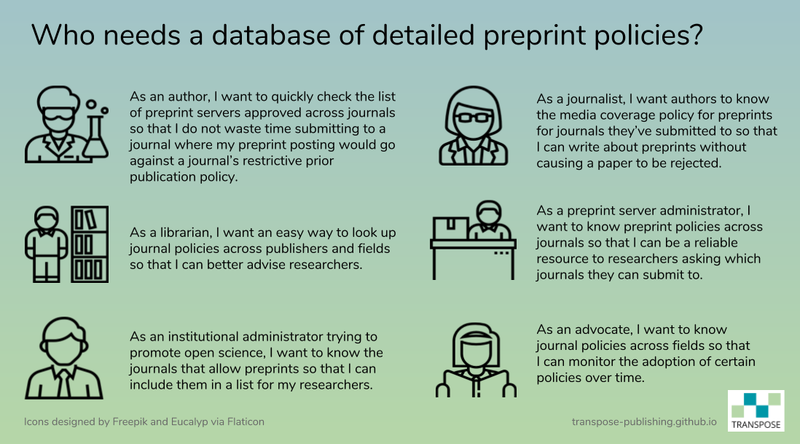 Publisher Preprints As a preprint server, I want to be know preprint policies across journals so that I can be a reliable resource to recommend to researchers what journals to submit. Institution Preprints As an institutional administrator trying to promote open science, I want to know the journals which allow preprints so that I can include them in a list for my researchers. Institution All As a librarian, I want an easy way to look up journal policies across publishers and fields so that I can better advise researchers. Technology & service provider Preprints As the developer of a reference manager, I want to know which journals allow citations to preprints so that I can code citation styles appropriately, or notify users when they try to add a disallowed citation. Technology & service provider OPR As the representative of a manuscript tracking system, I want to learn journal peer review policies so that I can better serve the peer review needs of my clients.